Access 2016 gives you the ability to upload a data table from an existing source such as an Access desktop database, an Excel spreadsheet, or text file. Follow these steps to upload an existing Access table. Steps for other file formats are similar. Click Table from the Create group on the Home tab of the Ribbon if necessary. 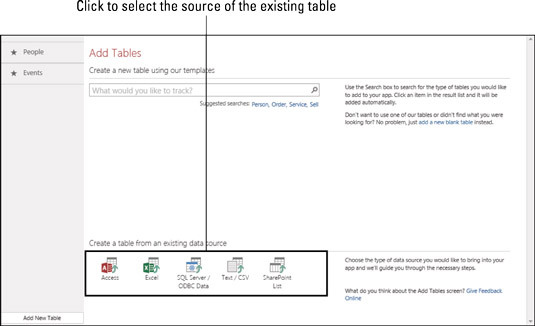 Click Access from the Create a table from an existing data source list. The Get External Data dialog box appears, ready to serve. Select the source of the existing table. Click Browse, navigate to the file location, and then click on the file that contains your table. The path and file name are entered in the File name text box in the Get External Data dialog box. The Import Objects dialog box appears. Select the table name and click OK. The table and its data are imported into the web app. The imported table appears down the left side of the web app screen. Web app tables are maintained just like Access desktop database tables. Just open the Navigation Pane (F11), right-click the table, and choose Design View.